When asked why Omaha, Shim Moore said, “Omaha is the first place we ever sold out a show.” Their national CD release show for their new album “Connect” was held at Sokol Auditorium in Omaha, NE. Sick Puppies said that Omaha is their home away from home and enjoy playing here every time. With huge support from 89.7 The River and Sophia John, the radio station played their music before many people even knew who they were. 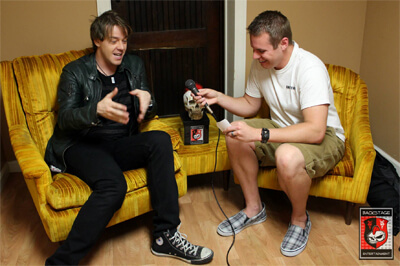 Backstage Entertainment sat down with Shim Moore, frontman for Sick Puppies, in an interview before their show. We talked about the new album and first single, “There’s No Going Back.” Shim had an interesting take on why he used profanity in his lyrics to the single and how he has to tailor some performance to their kid fans. As we got to our favorite part in the interview, the “BSE Box,” Shim mentioned earlier in the interview that he had done some acting. We knew he would be perfect for the recently added “action words” part during the interview. From acting like he was on “The Jerry Springer Show” to complaining about the interviewer. Shim did a great job playing along with our process and I’m sure many of the fans will love it. Make sure to check out the links below to watch the interview with Shim Moore and see the photos from the interview and live shots from their performance.